support and full-length, lightweight cushioning. EXTRA SUPPORT SYSTEM The anatomically shaped arch support and extra deep heel cup combine to deliver maximum support and stability. DUAL LAYER CUSHIONING SYSTEM The dual layer cushioning system provides the maximum amount of cushioning possible. The inner cushion is a layer of PORON® Cellular Urethane, which provides superior shock absorption for the entire foot. PORON® is lightweight & durable; it does not harden like PVC foam, does not break down like Latex foam, or take a compression set like EVA foam. The bottom cushion is a soft layer of long-lasting, polyurethane foam. 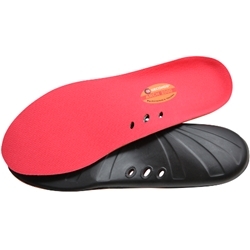 ANTI-BLISTER TOP COVER - COOLER - DRIER FEET By controlling the amount the foot slides across the insole’s surface, the anti-friction top cover helps prevent blisters and keeps feet cooler & drier. FIGHTS ODORS The antimicrobial in the top cover helps keep the insole odor free.